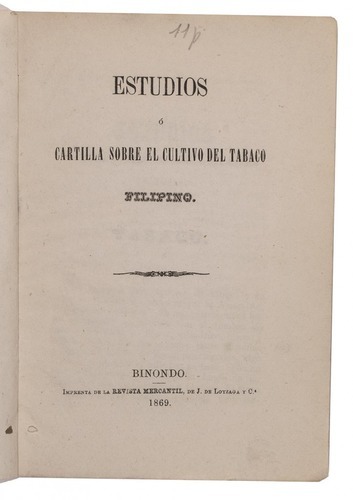 Estudios ó cartilla sobre el cultivo del tabaco Filipino. Binondo, J. de Loyzaga and company, 1869. 8vo. Later green stiff paper wrappers, red paper spine. 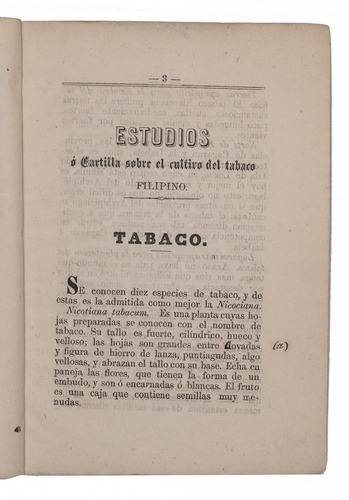 Very rare study on the cultivation of tobacco in the Philippines. Arents identified the author as Felipe Gobrantes, but it seems more likely that the author was Felipe Maria de Govantes, who published several historical studies on the Philippines. The treatise comments on the proper soil and appropriate areas for planting tobacco plants, describing the Philippine island Luzon and other fertile provinces. Other sections deal with irrigation, fertilization, pesticides, sowing, harvesting, preparing the tobacco, etc. 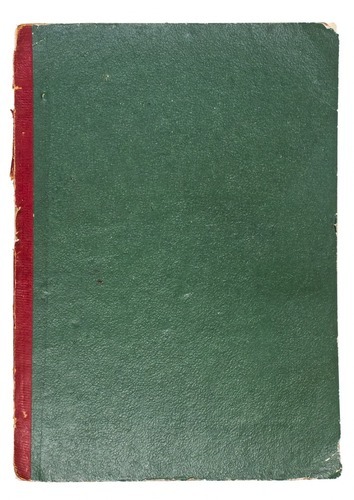 Spine damaged, front wrapper detached. Internally in very good condition, with a manuscript correction on page 3 and page 8. Arents 1831; not in KVK; Vindel, Bibliotheca Filipina; WorldCat.